Al Gore applauds Howard Dean Tuesday at a rally in Manhattan's Harlem. 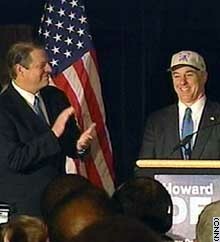 Watch CNN's live coverage of the formal endorsement of Howard Dean by Al Gore, scheduled for 8 a.m. EST Tuesday. Then at 3:30 p.m. EST, see an interview with California Gov. Arnold Schwarzenegger on "Judy Woodruff's Inside Politics." And "Crossfire" at 4:30 p.m. EST, originates from the CNN Election Express in Durham, New Hampshire. CNN's Kelly Wallace on expectations that Al Gore will endorse Howard Dean. WASHINGTON (CNN) -- Former Vice President Al Gore will endorse former Vermont Gov. Howard Dean for the party's 2004 presidential nomination, Democratic sources said Monday. The endorsement could well cement Dean's status as the leading Democratic candidate heading into the kickoff contests now just weeks away in Iowa and New Hampshire. Dean's campaign declined comment. But a source close to the former vice president said Gore had always intended to endorse a candidate "when he felt comfortable doing so," and that he believed this was "a moment of impact." This source said that Gore -- the Democratic Party's presidential candidate in 2000 -- thinks a protracted primary campaign would serve only to help President Bush. Another source said the endorsement would occur at 8 a.m. Tuesday in New York City's Harlem -- where former President Clinton maintains his office -- and that Gore and Dean would then travel together to Iowa. Dean would then head to New Hampshire for the crucial Democratic debate later Tuesday. The announcement will come nearly three years to the date after Gore, who won the popular vote but lost the electoral vote in the disputed 2000 election, conceded defeat. Sen. Joe Lieberman, Gore's vice-presidential running mate in 2000 and a current presidential hopeful, said he would continue to "to fight for what's right, win this nomination, and defeat George W. Bush next year." The poll showed that 25 percent of registered Democrats support Dean as their nominee, with retired Gen. Wesley Clark in second with 17 percent. In an interview before the news broke on CNN's "Inside Politics," Dean played down his front-runner status. "Well, guess what, the people of Iowa, New Hampshire, South Carolina and Arizona and so forth get to decide who the front-runner is. So, it's nice talk but I'm not buying it." Dean and Gephardt are the top two candidates in Iowa. Saying he respected Gore and fought for his campaign four years ago, Sen. John Kerry of Massachusetts said, "This election is about the future, not about the past."